UPDATE: We have confirmation that Happy Endings has indeed been cancelled. No word on if some other channel will pick it up. What do you think? Do you like Happy Endings? Are you hoping that another channel picks it up? So glad this one is gone. It was pathetic, and it should have been cancelled in season one. The only reason it lasted this long was that they put it with Modern Family for the second season. Another classic case of a GREAT comedy that couldn’t land a regular time slot- Maybe if the networks can’t figure out how to market what we want, Netflix? TBS? I really liked the show, but they kept moving it around, never could find it. Great show! Hopefully another channel will pick it up! Renew Happy Endings on TBS. side by side with Cougar Town! This show was not good. The ratings were so bad the first season that they should have cancelled it. People only watched the second season because if followed a major hit, and people can be lazy about changing channels. 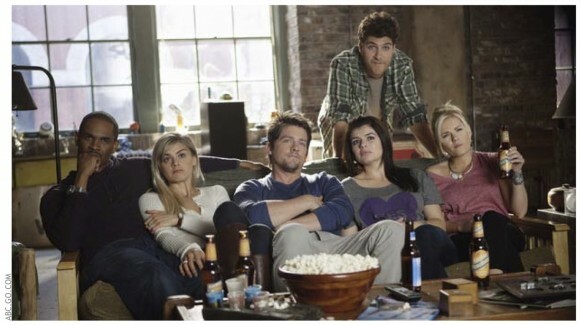 Still, Happy Endings lost most of the lead in audience from that major hit. On its own again in season three, people once again stopped watching. That, Jodi, is an excellent idea. I hope another channel pick it up. Why are all these shows being canceled, but they continue to make the same ole reality shows? Maybe TBS can pick it up & it can run back to back with Cougar Town!